Ever been to the bowling alley in the Chatan Sports Center? 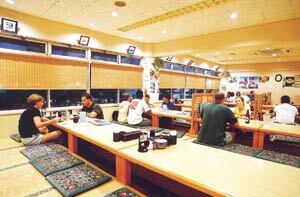 Did you know that there is a really nice restaurant on the second floor called Kitakaisen? If you've never been there, then you are missing out on a restaurant that could end up being your favorite on the island! And if you love sushi, you are in for a treat. All of their sushi combination platters are half price on Mondays. So for example, their 10-piece platter that normally runs ¥1,000 will only cost ¥500. They also serve California, Rainbow and Alaska rolls, which are popular with a lot of Westerners. Besides serving sushi and sashimi, this izakaya (restaurant bar) also offers an assortment of a la carte items such as baked chicken with cheese (¥600), salmon carpaccio (¥500), yakisoba (¥500), fried rice with chicken (¥500), Mexican tortilla salad (¥580), tofu steak (¥400), chicken steak (¥550), beef enchiladas (¥500), French fried potatoes (¥350), tacos (¥500) and fried chicken (¥400), just to name a few of the many items on the menu. 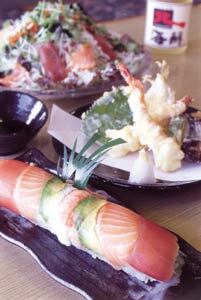 They also serve delicious yakitori, which all of you newcomers must try at least once while you are on the island. Different kinds of broiled and fried fish, tempura, noodles, soups and teishoku (Japanese sets that come with a main dish and rice, soup and pickled vegetables) are also available. Wednesday is Ladies' Day, when, if there are only women at a table, then everybody will receive 30 percent off the total bill. Kitakaisen also has a party room that will seat 15 to 60 people. There is no room charge, and karaoke is available upon request, also with no charge or extra fees. The parking lot is really big, so if you want to book a party, you don't have to worry about car-pooling. If you are heading to Highway 58 from Kadena Air Base's Gate 5, turn left at the stoplight directly in front of the Capital Steakhouse and the Zion Fellowship Church and Academy. Follow the road until you see the entrance to a large parking lot on your right. Once you turn into the parking lot, Kitakaisen is on the second floor of the building on your right. Enter the building from the front and take the elevator to the second floor. There is also parking available in the basement for those of you who don't want to get rained on during the rainy season. Hours of operation are from 5:00 p.m. to 2:00 a.m. with the last order at 12:30 a.m. For reservations call 098-936-7373 (bilingual staff available).